Vacation cooking is something I typically manage to avoid, as most of my vacations consist of visiting friends or staying in a hotel. I do like to cook, but I’ll be honest, there is nothing quite like having Claire cater your meals for a few days while you relax (don’t worry, sometimes I help)! This week, Claire is here to share some of her family’s traditions, along with some fabulous food. This is how you do vacation cooking! Take it away, Claire! One of the tragedies of adulthood is the end of summer vacation. For most of us, the summer months carry on nearly identical to their colder counterparts, except perhaps that a higher percentage of the day is spent casting desperate looks out the window, accompanied by discontented sighs. Or maybe that’s just me? I think I probably spend more time than most on nostalgia, but it’s easy to cast my mind back and envy my younger self her idyllic mid-western summer breaks. As a kid in Michigan, I spent the whole summer in the water. 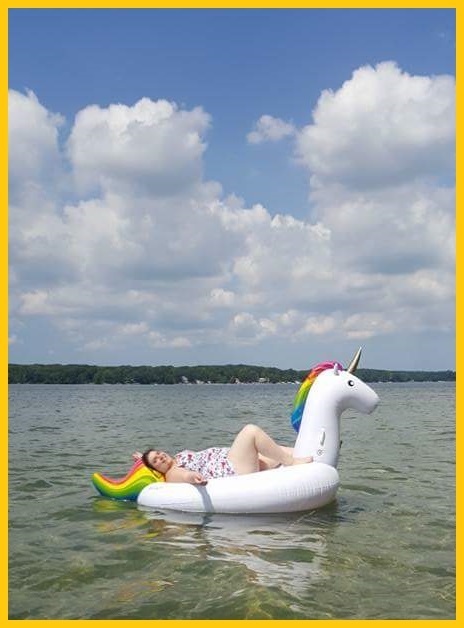 Whether it was the dinky little pond at the far end of my subdivision, or the beautiful clear waters of Long Lake in Traverse City, my summer days were defined by the presence of water. , but in California where I live, climate change and careless over-use of water has led to crisis-level drought, and the small lakes that used to exist near me have dried up completely, leaving only muddy pits and a rusted out car to mark where they used to be. The dryness of my adult existence has only exacerbated my need to indulge in memories of long days spent paddling around the lake in goggles and a snorkel, digging up clams and crayfish and interesting rocks. Eventually, I get to a point where day-dreaming isn’t enough, and I count up my vacation hours and trade them in for one precious week with my sisters in our family home on the lake. In past summers, my parents have always been there at the lake house taking charge of our vacations. My mom did nearly all of the vacation cooking, and my dad arranged all our activities around the best times of day to be out on his catamaran. This year, they were too busy yachting down the eastern seaboard to join us, so the role of head chef fell to my sisters and me, and I must say, we rose to the occasion. Vacation cooking presents an interesting set of complications, especially when you’re with a large group. What are all the dietary restrictions to consider? Who is doing the grocery run? Who is doing the inevitable second grocery run when we realize that we’ve forgotten something crucial? What pots and pans are available in the vacation house? And most importantly, what can be easily made in a large enough quantity to feed 13 people without forcing some unfortunate soul to spend all day in the kitchen? For my turn in the kitchen, I decided to make carnitas tacos. Anything that can be set up build-your-own style is a good idea in a group, and Mexican food is easy to make gluten-free, dairy-free, and soy-free. Plus, there is something so summery about tacos, especially when they are topped with salsa verde and fresh cilantro. 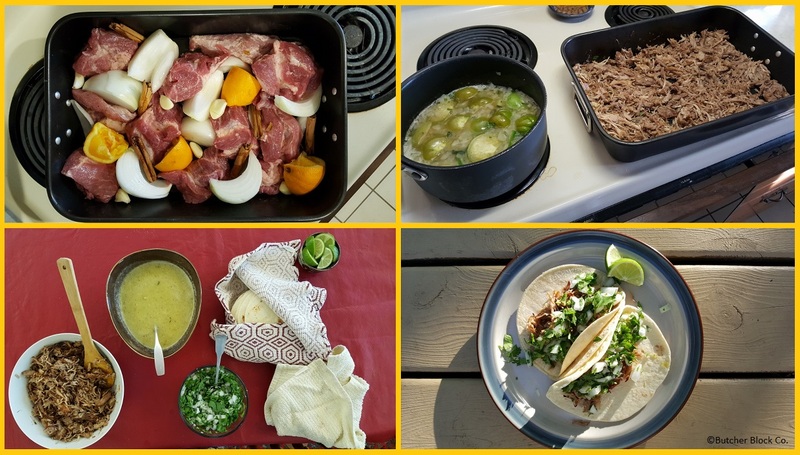 When I cook carnitas, I always use the Serious Eats no-waste recipe. Prep is quick and easy and I can walk away for 3 hours while it cooks, float around on the lake on a gigantic unicorn until my skin starts to crisp, then head back to the kitchen, whip up the salsa verde in about 15 minutes, and bing bang boom, dinner is served. I made this for the family last year, and it was such a huge hit, we ran out of meat. This year I added two additional pounds of pork, and we still ran out. I’m telling you, this recipe is a winner. The next night, we did brats and burgers with sweet corn and salad, all essential summer crowd pleasers. Anything that can be thrown on the grill and served up directly is a good pick for a large group. Another night, my younger sister made meatloaf and mashed potatoes. Meatloaf isn’t exactly a quick meal to execute, but it is a family tradition, and works well for a crowd because it can be made ahead of time, and it can be easily scaled up or down as the group requires. In our family, we go huge with the meatloaf, and then we make sure there is lots of good bread for leftovers sandwiches. Speaking of leftovers, since we only stay in the house for week, we try very hard not to over-buy groceries, so on our last night we had a big salad to use up the remaining produce, and we served it with whatever we could scrounge out of the fridge on the side. I ate every meal on the patio overlooking the lake, surrounded by my favorite people, with my bathing suit under my dress and the sun setting in the background. A week at the lake is never enough, but I live for adding more lake memories to my nostalgia bank, so I take what I can get.